Myrtle Beach at Its Best! True Blue is one of those courses that, after you get a taste of it, you just want more. The course is one of only a handful of Mike Stranz courses; in fact, there are two here, Caledonia Golf and Fish Club being the other. True Blue is built on the site of a once thriving indigo and rice plantation. Stranz was more than a golf course architect, he was a golf course artist. His courses seem to blend in perfectly with the natural surroundings. True Blue seems to rise out of the ground like a Phoenix rising from the ashes; it's also one of the most creative golf courses you will ever play. 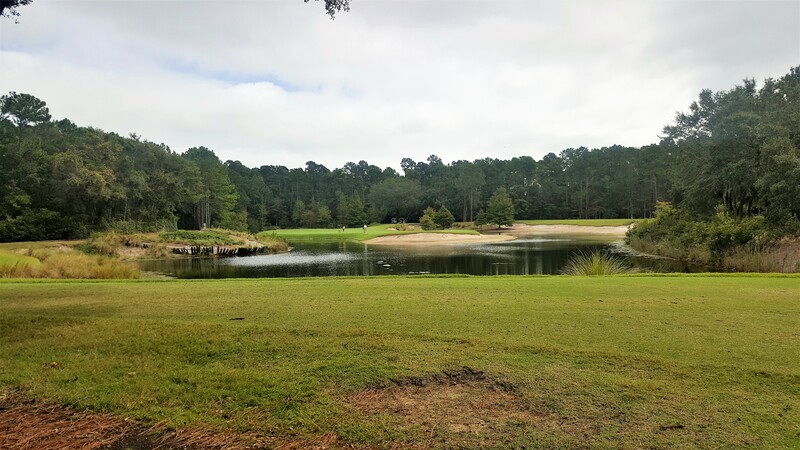 Stranz' creativity in design requires creativity in your shot making as you make your way around a course that has incorporated salt marshes, wetlands and maritime forests of twisting live oaks and pine trees into the layout creating memories that are one of a kind. True Blue Golf Club was Mike Strantz's fourth signature golf course, and opened to rave reviews in February 1998. Caledonia opened in 1994 and shortly after True Blue opened, Stranz was named "Architect of the Year" by Golf World. 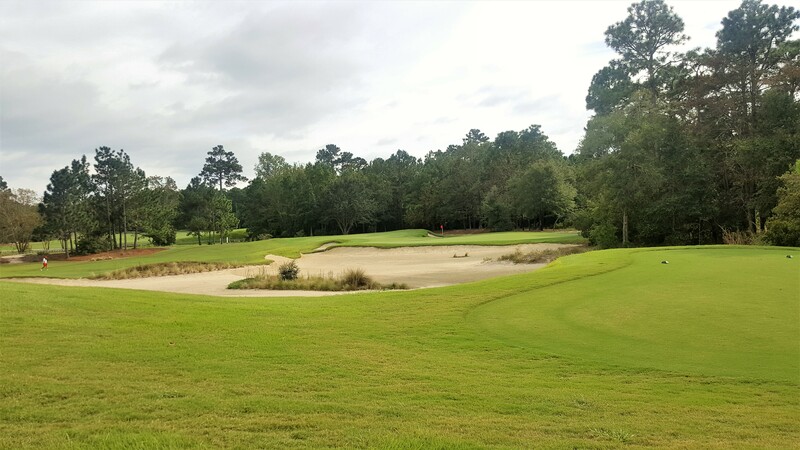 The course is not without its share of notoriety, being ranked 77th on Golf Magazine's Top 100 Public Courses in America list and 6th best public course in South Carolina. 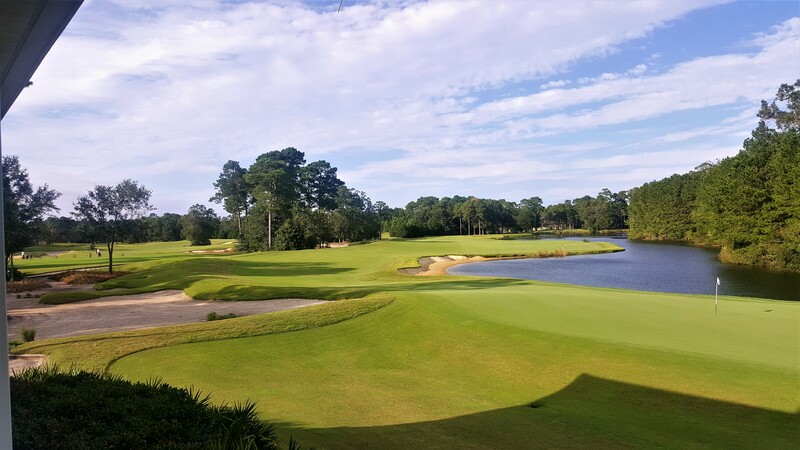 Golf Digest has also seen fit to rank True Blue the 29th best course in South Carolina (8th among public courses) and gave it 4 ½ stars for "Places to Play". But this course is not just for the guys; Golf for Women Magazine recognized True Blue as one of the country's Top 100 Courses for Women. 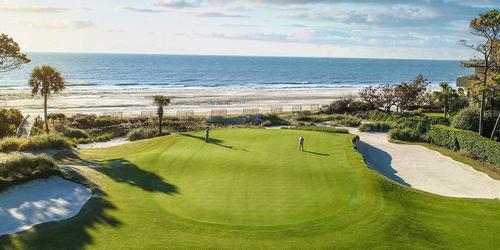 The course is an absolute must-play for any golfer visiting Myrtle Beach. 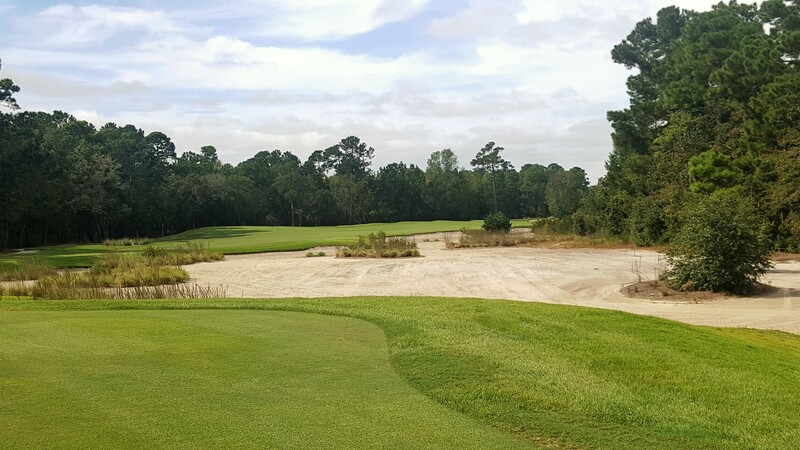 Sand is a legitimate concern at True Blue as it figures into every hole on the course, and some of it will penalize you severely. Technically, there are no bunkers; every grain of sand out here is considered a waste area. It's packed down in many areas so, unless you're adept at hitting off your kitchen table, it can be a little tricky. Feel free to ground away, take some practice swings, even drive the cart through it; whatever you have to do to get the ball on the green. Because that's when the fun starts! Most golfers have never experienced greens like this before in their lives. They are some of the most unique sizes and shapes around. And, unlike designers who like to bury elephants in their greens, Stranz relies on lengthy angular greens - many slanting from back to front - putting an emphasis on slope and speed for longer putts. True Blue offers a set of tees to fit everyone's game. When in doubt, play the shorter set, you'll have more fun. Bit off more than you can chew out here and you could be in for a long day. The Back/Gold Tees measure 7,126 yards with a course rating of 74.5 and a 138 slope. Most golfers will find that the White Tees (6,375 yards/71.1/132) will give them all the golf they can handle and still leave with a little dignity. Of course, that part depends on how you fare on Number 18, more on that in a minute. Seniors typically play from the Black Tees (5,736/68.2/123) while ladies will enjoy themselves from the Green Tees (4,995/69.3/125). Favorite Par 3: number 3, 141 yards (White Tees). This hole can make or break your round early on. Depending on the pin position there can be a 25-yard difference between front and back. The hole plays a lot tougher with the pin in front because the landing area is smaller. Also, if the pin's up front and you hit it short or long, you're in the bunker, which sits well below the putting surface. Regardless of pin position, it's all carry over water and sand to an island green. If the pin is in the back, play to the right of the hole and let the ball funnel down towards it. Par is a good score here. This is a good display of Mike Stranz the artist. Favorite Par 4: Number 18, 406 Yards. Stranz has indeed saved the best for last. Water is in play all the way down the left side and the fairway slopes off on the right into a large waste bunker. It's 200+ yards to carry the bunker just across the water and if you can find the middle of the fairway off the tee, you're halfway there. Play your approach shot into a long narrow green that angles back left to front right and slopes down towards the water which protects the entire left side. Once you get on the green the fun begins as onlookers from the clubhouse porch cheer and jeer your efforts. This may be as close as you ever get to playing in front of a gallery so relish the moment. Favorite Par 5: Number 1, 499 yards (White Tees). For my money, True Blue starts you out with the best hole on the course and builds from there. Waste bunkers frame the left side of the fairway on this long dogleg left, leading up to a creek in front of a well elevated green, meaning you'll have to use an aerial approach. For most players it's a three-shot hole because of the creek. To complicate matters, there's a bunker that wraps around most of the green which is very narrow, yet receptive. A good-looking golf hole that can be tamed. Best Chance for a Low Number: Number 4. Par 5, 493 yards. A low number can be had with two good shots back-to-back as long as you're willing to risk it. A well struck drive in the neighborhood of 250 yards that finds the middle or left side of the fairway will leave a second shot of around 220 yards into the green. Here's where the risk comes in: it's all carry over water with sand catching anything left or right of the putting surface. It's one of the smaller greens on the course but receptive to long approach shots. Whatever you do, avoid the pot bunker to the right of the green; it's a tough up and down. Go for it; you didn't come here to lay up! Last Word: True Blue certainly lives up to its reputation as one of the best golf courses in South Carolina. The late Mike Stranz sure did himself proud. 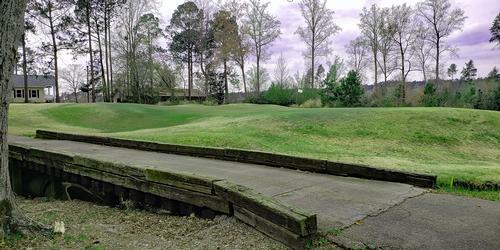 Other than the par 3s, most of the holes are doglegs, some of which are created by the presence of the waste bunkers. This places an emphasis on distance and direction control. Spend too time in the waste bunkers and you'll wish you went to the beach. A lot of the rough is cut just slightly longer than the fairway which tends to let the ball roll more, which can be both good and bad. True Blue has some pretty impressive practice facilities too. Range balls are included with your greens fees and it's highly advised that you hit all the balls they give you. There are a number of targets at varying distances so you can hit every club in your bag. 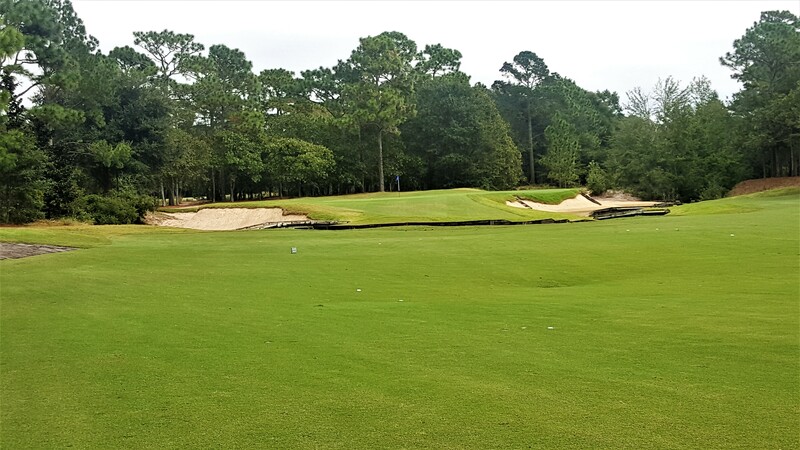 Be sure to practice your bunker play; if you can make it around this course without having to play out of the sand, you've accomplished something! Inside the clubhouse you will find a pro shop packed with all kinds of logoed gear from top apparel companies and some new up and comers. The True Blue Grillroom serve up all of you favorite post-golf libations as well as some authentic Lowcountry food. Breakfast is served from 7 am - 10:30 AM and lunch is available from 11 am - 3 pm. 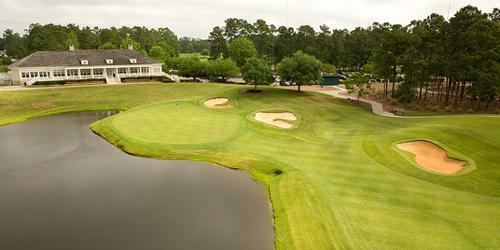 True Blue is a proud member of the Waccamaw Golf Trail.